Looking forward to bauma 2019 in Munich, Continental has announced that it will be taking a more active role in the area of fleet management systems for the construction industry – with a special focus on digitalization and telematics. Over the mid-term, the technology company will be able to offer fleet operators and construction companies worldwide a fleet management system that is brand-independent and is based on products the company is offering today. Today, a full 95 percent of all construction projects take too long or are too expensive according to the McKinsey report "Reinventing Construction." Along with external reasons, this is also due to insufficient information being available in real time, e.g., on the status or utilization of vehicles. In this context, Mario Branco, Head of Business Development for Off-Highway Applications at Continental, names three significant advantages that companies with digital fleet management have over the competition: better utilization, lower maintenance costs and more reliable planning. "Those who work with us on telematics and fleet management can utilize equipment better, reduce maintenance costs and coordinate job assignments optimally. 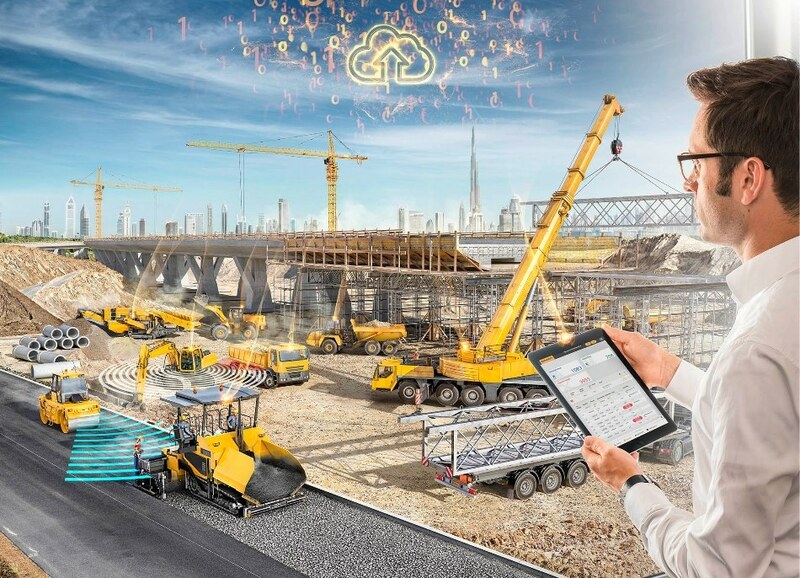 Merging the data of connected machines and vehicles in one system enables companies to reliably plan costs and timeframes at the construction site and avoid expensive delays," says Branco. "Experience in the commercial vehicles sector has shown us that professional fleet management offers precisely this transparency in real time." An example from the commercial vehicle world illustrates how collaboration with the manufacturers of construction equipment and vehicles might look. Recently, Continental partnered with the Chinese commercial vehicle manufacturer FAW JF to develop a complete telematics ecosystem. The platform is intended to offer functionalities which optimize overall operating costs, improve customer service and boost the efficiency of logistics processes. Here, Continental is introducing the competence of its internal telematics expert Zonar from Seattle. The fact that Zonar already offers various fleet management services – including for construction equipment manufacturers – gives Continental an advantageous starting point for supporting the industry even better in the future. Precisely tailored functionalities have been established together with OEMs which interconnect construction equipment and vehicles and enable micro-services. An example is the Electronic Verified Inspection Reporting app (EVIR) from Zonar, which assures standard-compliant execution of inspections before and after drives and which will be on display in a new version at bauma. This is where experience with telematics data also comes into play. But Continental is not only relying on Zonar. It has been developing telematics solutions and digital tachographs under its VDO brand for many years now. It also has considerable expertise in secure handling of data from its tachographs business and from the recently acquired company Argus, which specializes in cyber security. Continental will make all this knowledge available to the construction industry as well. Nonetheless, comprehensive data and evaluations of machines and vehicles represent just one step towards more efficiency in fleet operation in the construction industry. "For operators, it is of immense importance to have a single interface for their mixed fleets. However, the systems available so far have always been closed, always manufacturer-specific. A lot of potential is lost because of this situation," says Branco. However, the new AEMP telematics standard is now changing requirements. The ISO 15143-3 standardizes 20 data points for exchanging the data of construction machines – and thereby enables manufacturer-independent fleet management systems. The data points range from positional data and operating hours to fuel consumption and the display of warning lamps in instrument clusters. Zonar is already implementing the new standard in its systems, and first pilot projects have begun in North America. Continental will be presenting a solution for on-board weighing that shows the actual total load as well as the pressure on every single axle. This information can then be made available to the driver via a display and can also be transmitted via the cloud to a business analysis or fleet management tool. The system is based on a strain gauge sensor, mounted on the axle, which determines the load very precisely. The system can be retrofitted, and manufacturers have also started to test it. In addition, a new photovoltaic solution with flexible solar modules can be used to deliver sustainable energy to cover the higher energy needs for telematics applications and to protect the batteries of construction machines in their deactivated state. The solution from Continental can cover from 10 to 20 percent of daily energy usage, depending on the vehicle type, location of use and ambient temperature.